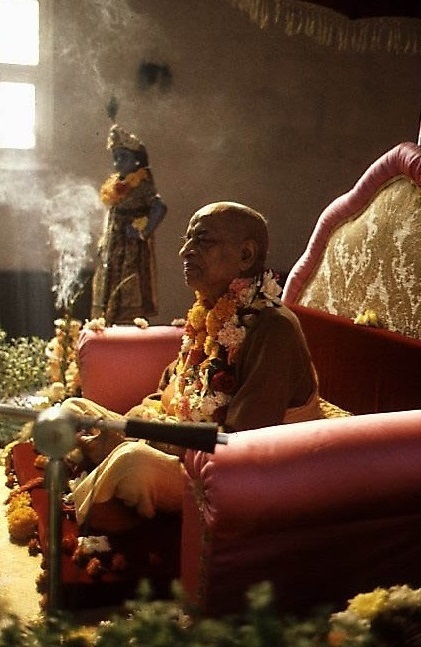 This attraction for Kṛṣṇa can be developed in the association of devotees, satāṁ prasaṅgāt. Automatically, nobody's attracted for Kṛṣṇa. The whole world is like that. So the Kṛṣṇa consciousness movement means to give these people a chance to associate with devotees and thus become attracted to Kṛṣṇa. That is required. Mayy āsakta-manāḥ pārtha yogaṁ yuñjan mad-āśrayaḥ. Mayy āsakta, to become attracted by Kṛṣṇa. Kṛṣṇa means attractive. Kṛṣṇa. Akasatira. Kṛṣṇa means attractive. Just like magnetic stone, attractive; naturally the iron... But the iron, if it is rusty, it cannot attract. It cannot attract. Similarly, Kṛṣṇa is attractive, and we are part and parcel of Kṛṣṇa. We are also attracted by Kṛṣṇa. But because we are now covered by the māyā rust, we are not attracted. This māyā rust has to be polished; then you'll be attracted. Otherwise Kṛṣṇa is attractive. Kṛṣṇa means attractive.